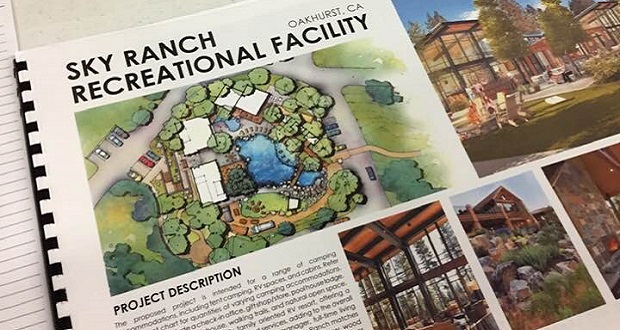 OAKHURST – With the possibility of a big recreational development coming to the Sky Ranch area north of town, some people are delighted with the idea of a new destination location while others have expressed concerns. Now, an important county meeting is set, and the public is invited to attend and potentially influence the outcome. 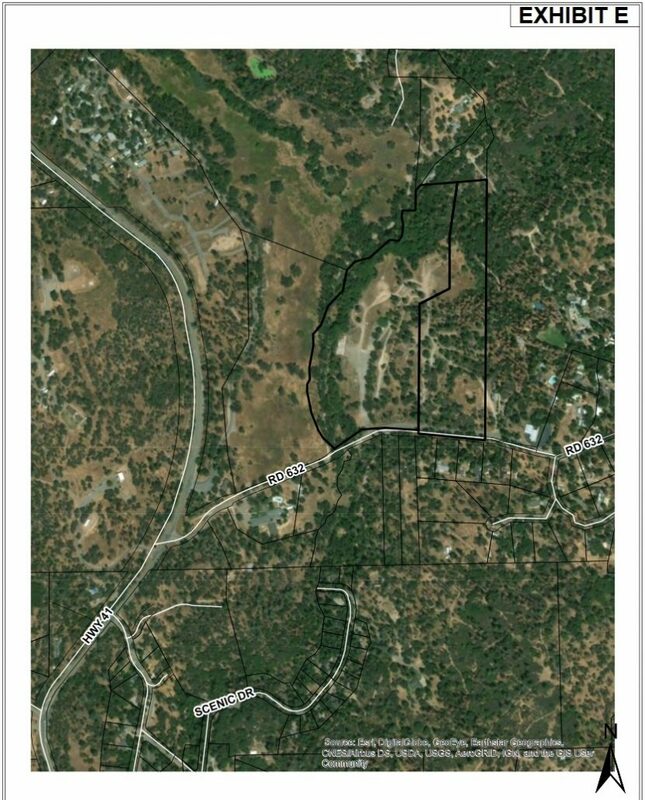 An RV resort and camping facility proposed for Road 632 will the subject of a Madera County Planning Commission meeting in Oakhurst on Tuesday, Feb. 12, at 6 p.m., at the Oakhurst Community Center. Red Tail Acquisitions has requested a Conditional Use Permit (CUP) from the County to allow for a Recreational Vehicle (RV) Resort with mix of RV sites, cabins, and camping sites on the north side of Road 632 (Sky Ranch Road) approximately 500 feet west of the intersection with Country Club Drive West. The property is owned by Castle Rock Estates, Inc. The request includes a General Plan Amendment from RR (Rural Residential) to CC (Community Commercial), and to amend the Oakhurst Area Plan from RR (Rural Residential) to CC (Community Commercial). The proposal was initially heard at the regular meeting of the Planning Commission on Jan. 8, but no action was taken. 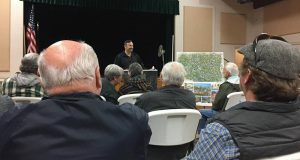 After several residents of the Road 632 area expressed concerns, a vote on the CUP was delayed in order to allow the developer to meet with the public. That meeting was held on Jan. 31 in Oakhurst with about 100 people attending. Tim Kihm, a consultant who represents the land owner, explained the plan and addressed residents’ concerns. Kihm noted that this development idea is part of a unique trend and there are many companies that may want to do this type of thing who may not have the 30 years experience that his people have. He said they want to hire local trades people, and will be removing dead trees and creating beautiful landscaped space. John Kimbro, a once-local resident, is slated to be the manager of the property. He has spent 25 years in the RV camping business, will be working on the implementation of the plan, and will be on-site once it’s operational. Several residents were concerned about the congestion this would create on Road 632. Kihm said they plan a speed check-in as a measure to avoid backup, with a main entrance and a secondary entrance. According to the plans, the water and sewer will be self-sustaining. A treatment plant will eliminate the need for septic, and tertiary treatment will provide water for irrigation. They have also drilled two deep wells. The plans include a dog park and a pool, and it is anticipated that there will be between 250 and 850 visitors per day, with the facility being open year-round. Kihm anticipates 43 to 50 percent average occupancy. The plan allocates 333 parking spaces for on-site use, including 109 RV spaces, 55 camping sites, 34 car camp sites, 26 walk-in sites, 6 yurts, 20 Air Streams, 11 Montana tents, 14 tree house cabins, 5 assorted buildings, 5 service buildings, 12 trash enclosures, and 36 guest/ employee parking spots. Attendees at the Jan. 31 meeting raised concerns about emergency evacuation plans, congestion and fire danger. Others asked if the facilities, such as trails and the swimming pool, would be made available for use by locals. These and other issues and concerns will be discussed at the meeting on Feb. 12. The facility is intended for a range of camping accommodations including tent camping, RV spaces and cabins. Site amenities include a check-in office, gift shop/store, pool house lodge, pool, spa, restrooms, clubhouse, walking trails, and natural open space. The intent of the project is to provide a quality family oriented RV resort, offering a comprehensive number of amenities and services, adding to the overall experience at Sky Ranch. Except for the site manager, full-time living will not be allowed. The character of Sky Ranch matches Oakhurst, utilizing natural wood and colors, as well as heavy wood beams and stone. Capitalizing on views and focusing on connections to the outdoors, the built structures incorporate a considerable amount of glass to maximize transparency to the outdoor environment. All existing onsite structures will be demolished or relocated. 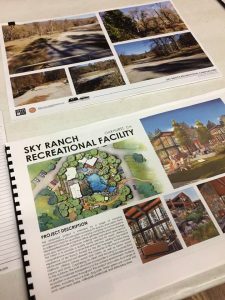 Outdoor recreation is provided throughout the project and caters to a range of abilities, including: bocce ball, dog park, linear green par course trail, pool, open lawn areas, volleyball, pickle-ball (a cross between tennis, badminton and Ping-Pong), and slides/play area. The site was previously developed as a saw mill with several building pads and associated log processing areas, including various lay down areas for the harvested logs and storage areas still being evident. A dominant remnant structure from the previous use as a saw mill is the metal conical smokestack. The site is crisscrossed with various roads, graded pads, paths and man-made water conveyance ditches used to collect and recycle the water sprayed on the stored logs to prevent the drying out of the wood. A significant portion of the site has been previously scraped, brushed, and masticated with some drought and pine bark beetle impacted tree stands removed to reduce potential fire fuel load. Tourism and recreational resort development, generated by Yosemite National Park, Bass Lake and Sierra National Forest attractions, have replaced lumber as the primary economic development base. More than one million people enter Yosemite National Park through the south gate entrance on Highway 41 which passes through Oakhurst. The impacts of tourism on the community are most significant during summer months, when vehicular trips along Highway 41 are the highest. While tourism drops during the winter months, there is still a call for amenities along Highway 41, of which this RV park can play a part of. Click here for the Madera County Staff Report and general plan information. The Oakhurst Community Center is located at 39800 Road 425B. The meeting will be held in the main hall.